I’m always and forever helpless in the face of a tuna melt – my favorite diner food after bacon egg and cheese on a roll – so I am doing that thing I do with classic recipes that are near and dear to my heart. And by that I mean I am messing with success by trying as many different spins as I can think of in an effort to eat as many tuna melts as humanly possible. In this case, I added a secret ingredient that had the Southern husband extremely concerned about his dinner prospects that night…but I’m happy to report that it turned out creamy, dreamy and delicious. Want to to take your tuna melts to luxurious new heights? 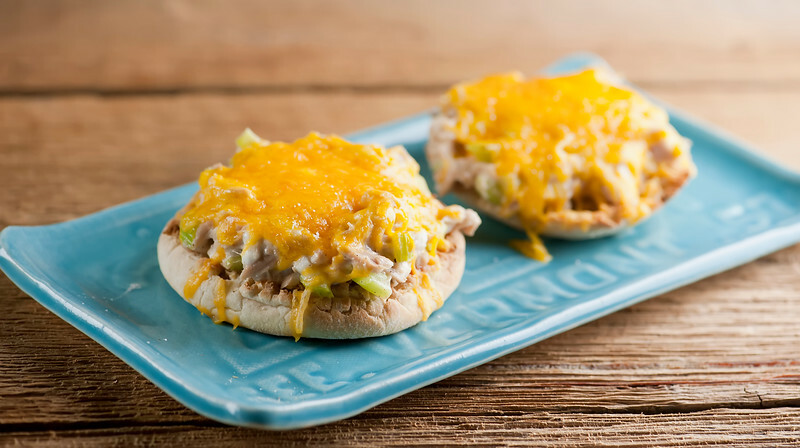 Let’s make it!The classic tuna melt recipe is mayo-based tuna salad spread on bread, topped with cheese and either run under the broiler open-faced, or topped with another piece of bread and grilled in a pan. I usually go for the open-face approach when making a tuna melt, myself. The one thing that can make a tuna melt less than amazing, however, is if the tuna salad turns dry during the broiling or grilling. There is nothing sadder than taking that first, highly-anticipated bite and not getting the melty scrumptiousness that you were dreaming of. So my tuna melt quest was all about making sure that the tuna salad was as creamy and dreamy as humanly possible. Cottage cheese. Please don’t leave me. Don’t do what the Southern husband did and practically fall on your knees in tuna melt horror. The cottage cheese gets mixed in with the regular tuna salad ingredients of mayo and celery, and I like to add a little chopped garlic and lemon juice just to give things the right amount of sass. Once the cottage cheese is mixed in and heats up with the rest of the tuna salad, it will melt into everything else, and all you will notice is the gorgeous creamy texture and just a hint of tang. We are talking tuna melt PERFECTION, people. I like to slather the tuna salad onto split, lightly toasted English muffins, so the tuna mixture can settle into all the nooks and crannies. I top the whole thing with loads of finely shredded cheddar, run it all under the broiler just until the cheddar is gorgeously melty, and then I serve it up. And there you have it. Secret ingredient, delectably dreamy, creamy tuna melts. I won’t tell about the cottage cheese part if you don’t. Spit the muffins with a fork and lightly toast them. Mix together tuna, cottage cheese, mayo, celery, garlic and lemon juice. Divide the tuna mixture among the four muffin halves. Top with cheese. Line a rimmed baking dish with foil and put the tuna melts on the baking dish. Broil the tuna melts until the cheese is melted, watching carefully as this goes fast! Serve at once, TELLING NOBODY about the cottage cheese part. Wow! Cottage cheese? I would have never thought of that Kate! Tuna melts are a favorite of mine too. I like that you serve them open face. I’ll need to definitely give the secret ingredient a go! Thanks for sharing! Have a great week! I also love mine open-faced on an English muffin. These look phenomenal! It’s been a long time since I’ve made a tuna melt! It’s one of my favorite, easy lunches, especially when it’s on an English muffin. I think I know what I’m having for lunch this week! I absolutely believe you. I’ve adapted my own recipe for egg casserole from a Paula Deen one. Of course hers calls for enormous amounts of sour cream AND cottage cheese, and they do give it a wonderful creamy tang. I’ve cut back on those significantly and subbed some pureed roasted cauliflower. Kids are none the wiser and holy smokes is it good! Oh my gosh – now I will have to find that egg casserole recipe, as it sounds right up my alley. LOVE the pureed cauliflower angle! Though I’d almost forgotten how much I’ve changed things around! I made it the “right” way a couple times, now I easily double if not triple the eggs, cut back on the cheese, sometimes a little flour, sometimes none, switch out spinach for zucchini, broccoli, or just the cauliflower… Clearly I’m great with directions… Which I’m admitting to someone who devotes a great deal of time to devotes a great deal of time to writing them! Yesssss! I love all your spins on the classics and this one is no exception! I grew up eating my weight in tuna melts, and I’ve actually had tuna with cottage cheese before, so I know first hand it IS DELICIOUS!!!! I haven’t had lunch yet, and now I’m wishing I had some cottage cheese in the fridge because I would be ALL over this like white on rice! SO GOOD! Cheers, Kate! Love a good twist on a classic dish and I eat tuna all the time. It’s such an easy quick lunch when I am home alone. Cottage cheese? I never would have thought of that! The cottage cheese is an unexpected ingredient! I’ll bet it does add a great creaminess! Perfect for a quick lunch or a light dinner. I hate dry tuna and I’m totally intrigued that you use cottage cheese. I’m not afraid. I love cottage cheese so I’m all in!